Cloth dolls and patchwork plush animals - the cutest you've ever seen! Home for some cute stuffed animals and other plush creations that are unique. High quality soft toy collectibles. Handknitted bunnies and teddies from a little cottage in Derbyshire England..
For the kawaii lovers, those who loves anything cute! Handmade cute plushies, felt food & more cute stuff! 8 Shop Of Little Horrors. Hand-made alternative fashion dolls, plush and play-things. Edward and Lilly softies include cute cats in pretty dresses and sleepy teddy bears. All softies are handmade original designs. More softie designs coming soon! Hi, I enjoy making handmade craft using felts and sometimes polymer clay to make some animals or monsters. Unusual plush creatures and related bits & Bobs! Many science-inspired items too. I like to read story, I like to made hand craft, I like plush, so I do all the plush come out from my memory, althought not my own design, but is my own hand, sew it one by one, to share my memory plush with all of you. My etsy site contains mostly plush sock creatures. There are a few other hand made items as well. OOAK wood board games will be listed soon. Cute and quirky plush made from new and recycled materials. Cute, pretty, must have gifts. Adorable handmade plush toys by Megan Baehr. Handmade upcycled toys, custom plush toys and graphic design. Cute and unique animal and other plushies. Handmade one of a kind plushies, we also offer customization, add names, dates etc or design your own plushie from scratch. I make eco-friendly monsters, gnomes, elephants, giraffes, and whatever else I can think of for baby nursery decor and childrens toys. I make all my creations out of upcycled materials and sweaters. craft designer & maker, i create in fabric and felt soft sculpture and also projects for books and magazines. Handmade plush toys with an emphasis on sock creatures! Welcome to pinutie! The handmade stores that sells cuteness in a tangible form! I enjoy sewing and crafting cute things to brighten up people's days. Original handmade amigurumi and crochet dolls of all colors! The Forgotten Friends hand crafts all those old familiar faces from our past childhood and many new ones with a bit of a creepy twist. Our little friends are made from only top quality materials. Creepy and awesome unique handmade plush! From crochet to sewing this is the site for all your gift needs! Babys, children and even grown-up love this site! This is where Raggedy Ann and Whimsy Dolls come to play dress-ups! Custom orders welcome. Electric Daisy Plush is handmade vintage fun with a touch of whimzy and love. I sell cute, cuddly, fun sock monkeys for all ages! Friends of the forest frolic in this land of adorable soft toys. Here you'll find lovely fawns and forest critters along with cute lit'l buggers. Handmade, eco friendly, and flirty stuffed animals and pillows lovingly stitched by me, Lisa, my critters are made from thrifted sweaters and vintage linens. Hand made custom crafted creatures, specializing in plush insects and other creepy crawlies. Rosewood Creations specializes in plushies and ll manner of textile and fiber arts. Geeky goodness! Home of the zombie legwarmer monkey and Doppelganger caricature plush! Batman, Star Wars, Kawaii and original GetSTUFT creations of course! Handmade ponies, pokemon, bears, and more. Check out what I have available or contact me for a custom creation! Handmade, unique, wool sculpture portraits of your favorite pets or animals made to order for you. But directly from the artist. Portraits available as Paintings, Drawings, Pendants, and more, also. 64 Miss Kitty Charms- handmade rad, kaPOW! ITS RAD, TRUST ME. Go go go! 65 The Prick Cushion ~ It's Just A Little Prick. ***Mature Content*** Naughty Notions and Gag Gift Plushies! Full of handmade plush monsters and weird, kawaii animals! 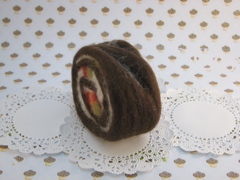 We make pet toys out of Ecospun felt (a product of recycled plastic bottles!) that are soft and fun to play with and snuggle! I sell felt, mohair and needle felted kawaii style creatures...from very tiny to not-so-tiny! Hand made plush characters and laser cut pendants from acrylic. Here you will find my original artworks compiled into a series of sketch/colouring books called "Creatures and Dreams". Also available are my toys, and 'Make Your Own' kits so that you can create your own plush and Origami creatures. Seriously funky art dolls,plush creatures, fine art figures and other curiosities to spark your imagination! Custom made plush toys and dolls. Robots, monster, and cute little freaks. A site about Happycloud Thunderhead. Toys, art,& fun! one of a kind freeform plush animals made of recycled cashmere and lambwool sweaters. Beautifully hand sewn plush stuffed animals made of blankie-soft fleece. Safe for all ages! HappyNest Toys (tm) by Lerayjess Designs - only on etsy. Handmade toys, art and whimsical fun stuff! a site dedicated to funny handmade plush toys, and funky accessories - free shipping for all items! Tranifer's Wonky Critters are original, handmade plush creations. Some cute, some creepy, but all very lovable. Cute felt plushies. Monkeys, fruity faces, brooches and pincushions! Krampus art plush dolls, ornaments, and fridge magnets. One of a kind art disguised as toys. 100% Handmade by Baron Exu and Baroness Joni. An assortment of brightly coloured Monsters, Robots, Ninjas and now Sumos made from wool felt, for kids and grown ups!